Well, we all know I cannot get enough of a good old easy marble – it is up there with gradients and leopard spots – so here is another one. In reality, this was to satiate my need for red talons – and being one not able to have just plain nails, something had to be embellish it… I give you gold! Now, that’s an embellishment! Yes, I am still obsessed by gradients. I just love them. So, I gave myself another one: a lovely yellow, orange and red, to go with my tropical mood, as I am on holidays in Brazil (hence the lack of posts). 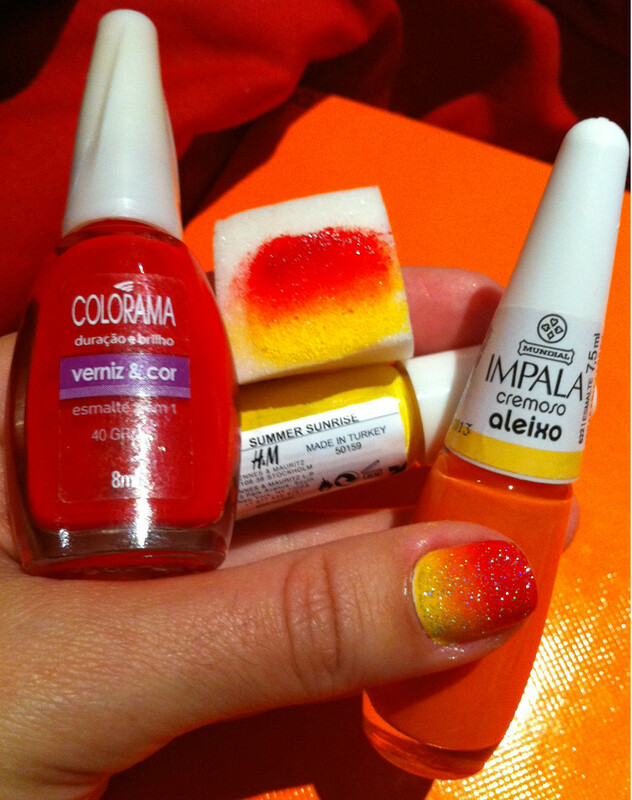 I used the H&M bright yellow summer sunrise, Impala’s orange aleixo and one of my fave reds ever, Colorama’s 40 graus. I used the sponging technique and applied the gorgeous Nails Inc electric lane topcoat. Ended up with a good seven layers and a lovely heart nail tattoo on my ring finger, from SkinArt UK to finish off the design! It lasted very well – eight days including pool days! 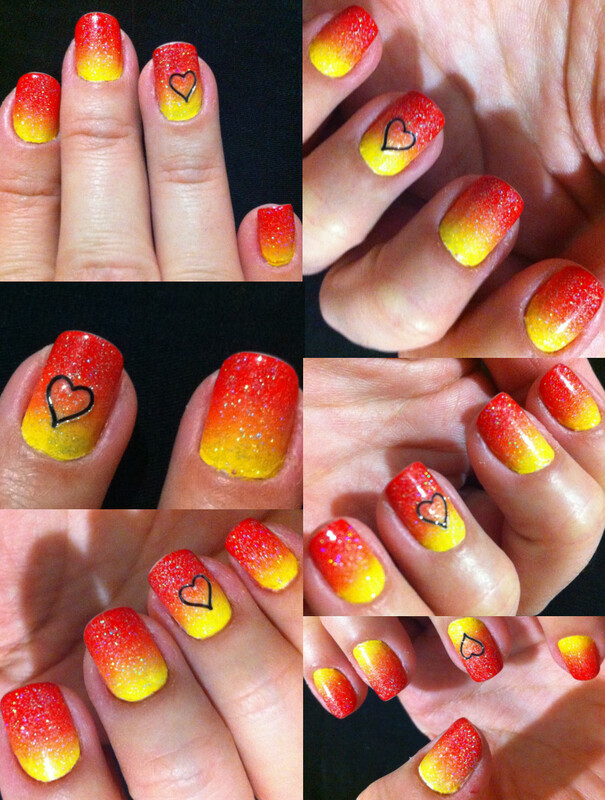 This mani lifted my spirits, it is cheerful and looks forward to the summer! Even with all the talks about “caviar” nails a while back, I always thought they would be a nuisance; I never thought it would be possible for it to last more than 2 hours – unless you don’t use your hands – and by that I mean walking around with them up in the air, not even pulling your pants up, honestly! But I went to Superdrug and spotted the pretty Nail Constellation bead pots from MUA, at an affordable £3! And of course, I could not resist. So I decided to give it a go. I bought Scorpio, a mix of gold, green, red and fuchsia tiny beads. Knowing it would bug the life out of me, I decided to apply only to an accent nail – my ring finger. Application was alright. But the bounce, so I had my bed covered in them. 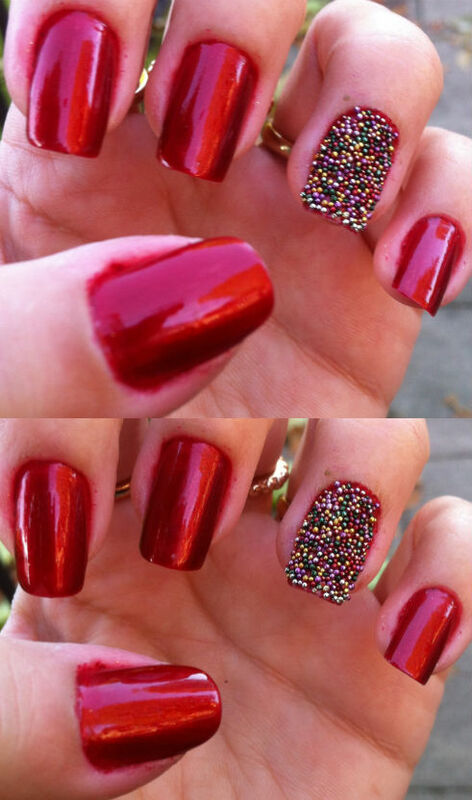 I applied a red nail varnish that matched the red beads to all nails – Colorama’s Pecado, an old favourite of mine – and immediately after the second coat, dropped the beads on the chosen nail. The funnel really helps the application, as well as gathering the fall offs back in the pot. I had to re-apply some base coat over to fill the gaps, but overall, it as pretty easy. 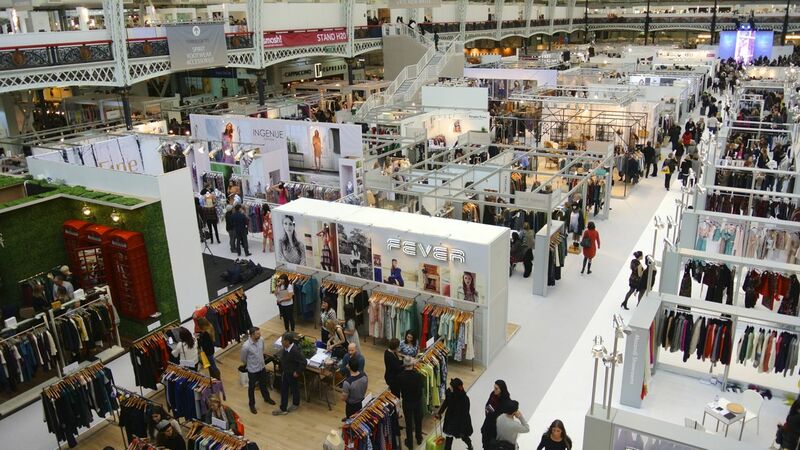 It looked alright, and even thought it caught lots of people’s eyes, I wasn’t overly impressed with it. It looks alright, but nothing exceptional. And then it annoyed me, a good 12 hours after applying. They catch on stuff, they fall, found some on my desk at work…. and so on… by the end of the day, there were lots of gaps, especially on my right hand, which I use the most. So they came off, only 28 hours after application. At least, that box is ticked and I shall not be trying again. So I used the lovely OPI The spy who loved me, which I was really looking forward to trying, and after I attended the party, I decided to give it dots in two colours: Colorama Ameixa and Ana Hickmann Jurerê. It looks very berry! The OPI application was good, their wide brush really makes life easier; the polish is a bit sheer, but two coats are enough. Durability is great! The dots were applied with dotting tools in 3 different sizes; as it is only the second time I do them, I think they came out pretty well – still have to nail the dots distribution though. Both polishes used for dotting were up to the task; the colours were solid enough. I wish I had used a lighter plum colour for the darker dots, as most of the time they seem black! The only problem is that I added the dots four days after I did the manicure, so the cuticles in the pictures, which were taken six days after I did the basic red mani, are not looking perfect, there is a little bit of growth going on, unfortunately. Still, I am pleased with this mani, and I shall be sporting more spotty nails in the future! Right, this week I did something I rarely do: I change my nail colour halfway through the week. I bought a pack of nail art striping tape, and was really looking forward to using it for the first time. 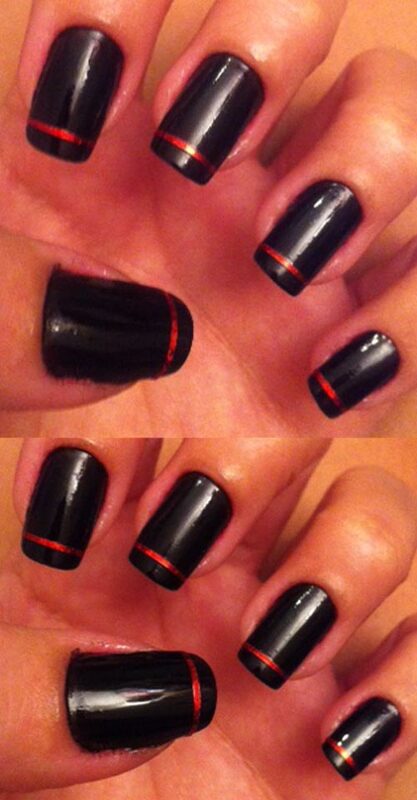 The selected tape colour was red, to combine with Barry M black nail polish, into one of my favourite colour combos. Barry M polishes are great with an amazing value, really, I cannot say this enough. Two coats, easy to apply, great coverage and durability, glossy finish. Then I applied the tape close to the tip, around the point a French manicure would end. I found application easy and quick. The problem is, after a few days, the tape started to peel off, and being particular as I am, I decided to remove it. So after three days, I took everything off, re-applied black to all of my nails apart from the ring finger, on which I applied a beautiful black and white nail wrap from Nails Rock to create an accent nail. The wrap was quite old; and I found application very easy – for this one, there was no heat-me-with-a-hairdryer palava. It was just a sticker. And the staying power was much better than the giraffe print Nail Rock wrap I used before. 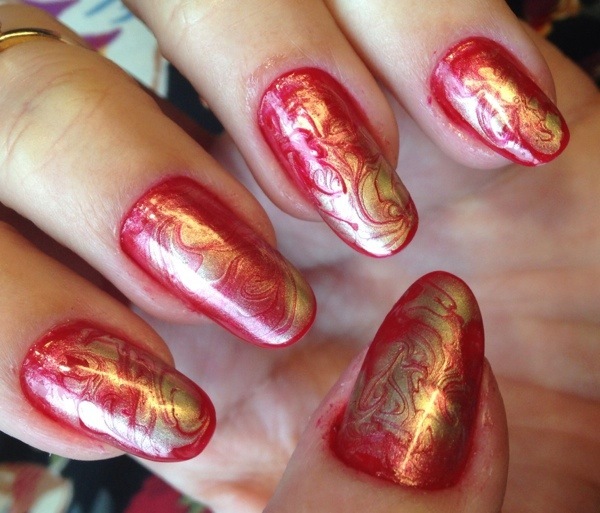 I found this foil beautiful, very glossy and striking. It did start to come off when I applied bronzing oil repeatedly to my body during a sunbathing session, but really, it was expected! Only problem: it was so hard to remove!!! So, there you go, although I had a “costume change” in the middle of the week, I was extremely happy with both versions of this week’s nails, I think they were both very classy! How much do I love this mani? I describe it as Dorothy’s ruby slippers for your nails. Seriously. So sparkly, a real jewel! I had this week’s mani all figured out, but had this urge to paint them my old time favourite red. But an ordinary red wouldn’t do, so as if by fate, I stumbled upon this gem at Topshop: Barry M glitter polish in red. The coverage is amazing, this polish is laden with glitter. 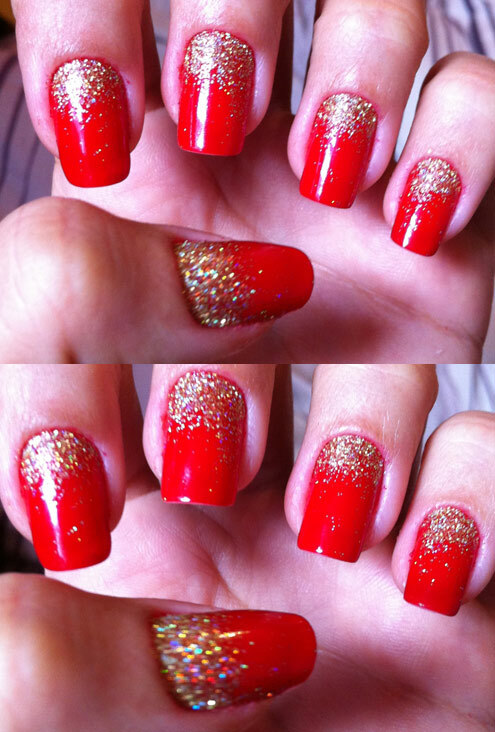 I put on a coat of Colorama’s 40 Graus underneath, and one coat of the glitter would be enough, but I settled for two. What a beauty it became. For being glitter, the durability wasn’t amazing; a couple chips appeared a good five days after application. But nothing too bad. Overall, I was delighted with this one. I don’t need to go on about how much I love red nails. Think I’ve done that enough in the past, so I won’t bore you with that. I used Colorama 40 graus – this polish is actually one of my favourites and if you have been to my blog before, you probably came across it somehow. It is a very bright red, intense, very shiny and leaning towards orange. Jubilee nails were my intention, but, somehow, I couldn’t be bothered to paint Union Jacks and wasn’t feeling the blue (I know, very lame), so I went for red with gold. I used the Andrea Fullerton’s Georgia Glitter Duo, and was very pleased with the result. I applied the glitter near the cuticle to still wet nails, and moved my finger downwards, with a gentle shaking motion, so it would fall towards the tips, I also had to very delicately spread a bit with the tip of my finger to get a more symmetrical effect. Durability was good. The Colorama polish lasts really well, and the glitter at the bottom, instead of the tip kept really well for the six days I wore it. This time was much easier to use the glitter puff than the first time I did. The mess was the same, though. Have to admit it is well worth it; I just love the look. Once again, I went a bit colour crazy! I have so many lovely nail polishes, that sometimes is super hard to choose just one, so I decided to do a warm colour palette – from yellow to red. I tend to wear off my French manicure by typing; when I removed, seven days after applying, I felt it could’ve gone for longer! Ace! I am really into French manis nowadays! This is a very bold look, but I don’t think it interfered with my clothes or was too out there for eyes to pop; people usually noticed (and complimented!) after looking carefully and closer. I absolutely love the colours combination – and I am dying to do a cold colours one… we shall see! I had a friend at home, so she also left with a slight more demure creation of mine; a purple and lilac French manicure, using a lilac from Miss Sporty and Collection 2000’s purple rain.